Tool boxes provide us with a safe and practical way of storing our tools, even going as far as helping us organize our entire arsenal of useful tools. What’s more, they are usually spacious enough to allow us to add more and more tools to the inventory on a regular basis. The last thing you want when working on a project is to spend unnecessary time looking for your tools. With a decent toolbox you won’t have to, nor will you ever have to worry about your tools being exposed to the elements. That said, let us take a look at what the market has in store in our quest to find out what are the ten best tool boxes money can buy. The 19” 22179 OEMTOOLS Tool Box is one of the best out there thanks to its exceptional build quality. Its measurements 19.3” in length, 9.9” in height, and 9.1” in width, and features a removable tool tray that helps you organize your tools better. With a built-in small parts organizer, you will never have to worry about losing your important tools and gadgets ever gain. The latches on the box are made from high-quality metal and keep all your belongings secure while the toolbox itself can hold up to 40 lbs and weighs just 3.75 lbs. The Keter Pro Tool Box 19 is designed to store all your tools securely and safely. 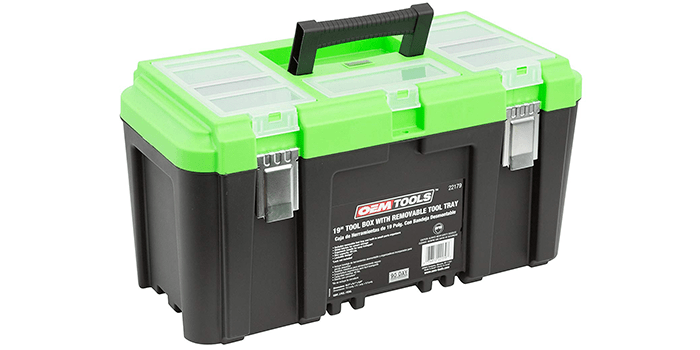 Measuring 18.99” in length, 9.84” in height, and 10.24” in width, this toolbox can easily store a variety of tools. The box is made from polypropylene resin and is extremely rugged and durable. It has two organizers on the lid to help you keep small parts properly while on the inside, it features a removable utility tray for added storage and quick access. Thanks to the metal lid stopper, the toolbox can stay open while you work. 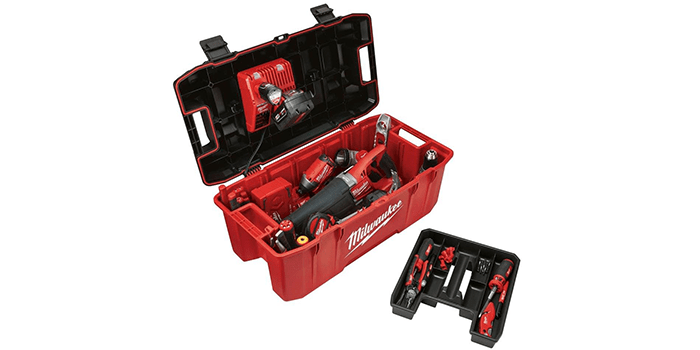 Milwaukee is one of the biggest names in the toolbox manufacturing industry and the 26 Inch Jobsite Tool is a perfect example of their quality. The box is extremely durable and comes with impact-resistant construction which keeps away cracks and breaks from accidental falls. Around the lid, there is a weatherproof seal that keeps your tools dry and in perfect condition. Along with its primary handle, this toolbox comes with pass-through handles on the side which help you carry it easier. The main compartment is quite big and can store a lot of tools. The Stalwart Heavy Duty Rolling Tool Box is a one of a kind product thanks to its portability factor. This toolbox comes with two 4.2” nylon wheels that enable you to take your tools anywhere. 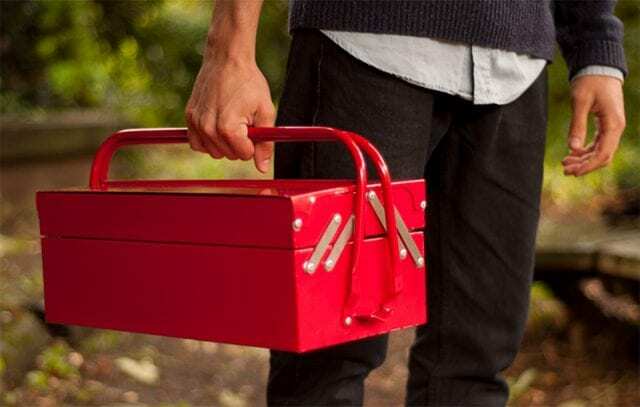 In terms of storage space, this toolbox stands out because of its 24 compartments for small parts, its 2 removable tool trays, and a deep compartment on the bottom. 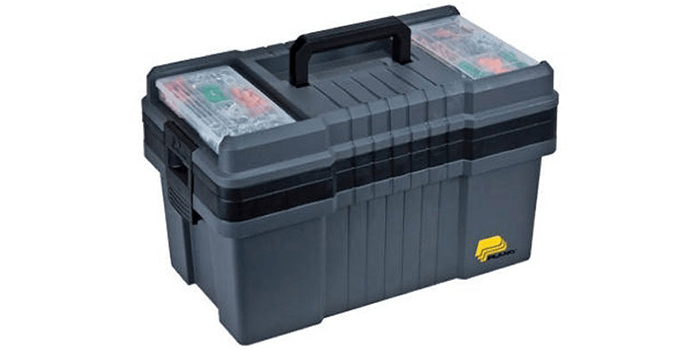 Made from rugged polypropylene, this toolbox will always keep your tools safe and secure. There are also hooks on the inside of the box for hanging cables if needed. Considered to be one of the most spacious toolboxes available, the Plano Molding Contractor Grade Po Series 22-Inch Tool Box is definitely one that can hold a lot of tools. It measures in at 22” x 12.5” x 13.5”, which should be spacious enough for all your tool storing needs. Furthermore, the box is made from high-quality materials and is extremely durable. It comes with two lift-out trays for additional storing capabilities. The box also features two StowAway organizers to keep all your smaller parts safe while both the latches and handle are reinforced for superb grip and comfort. 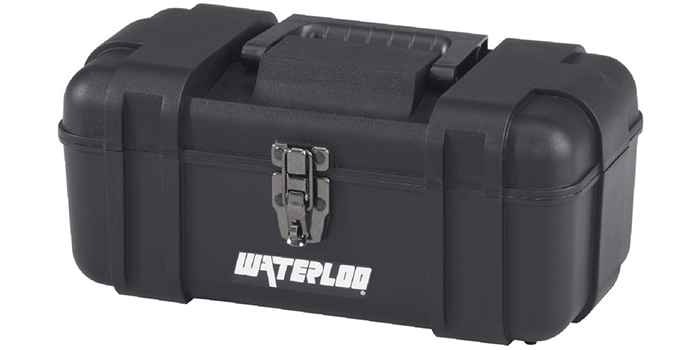 Although the Waterloo Portable Series Tool Box is rather small in size, it can hold a large number of tools and parts. The designing, engineering, and assembling of this toolbox was done in the United States, and it involves a top tray that can be removed for additional storage. Its comfort grip handle ensures that you can carry the toolbox for long periods of time without causing any discomfort. With its flush top, you can easily store or stack your tools without any hassle. Measuring 14” x 7.5” x 6.2”, this box is perfect for on-the-go jobs. 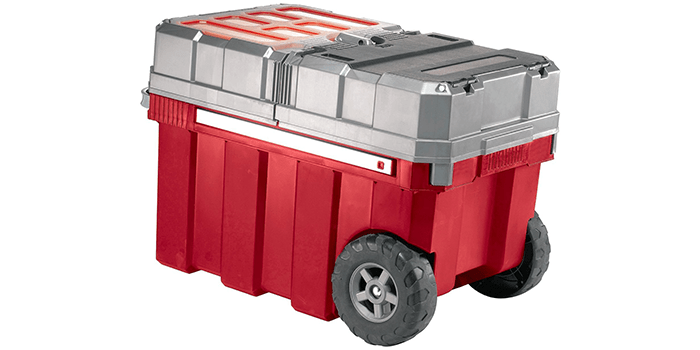 When it comes to ingenuity, the BOSTITCH BTST19802 Rolling Tool Box stands out for all the right reasons. For starters, the entire toolbox can be separated into two parts. One, a toolbox with a drawer and two, a bottom bin with a drawer. When together, the toolbox can be rolled around using its 7-inch rubber wheels. The heavy-duty ball bearing slides ensure that you can attach and detach the parts easily. Together, the toolbox can hold a total of 70 pounds and securely keeps your tools within at all times. 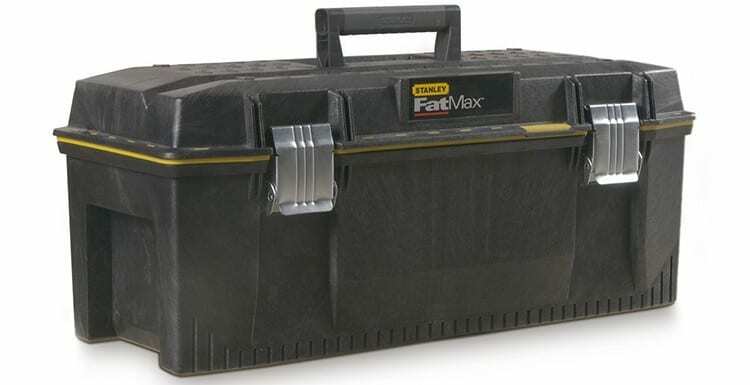 Stanley is a name that is known throughout the world in the tools industry and their 028001L 28-Inch Structural Foam Toolbox is definitely a stand-out product. 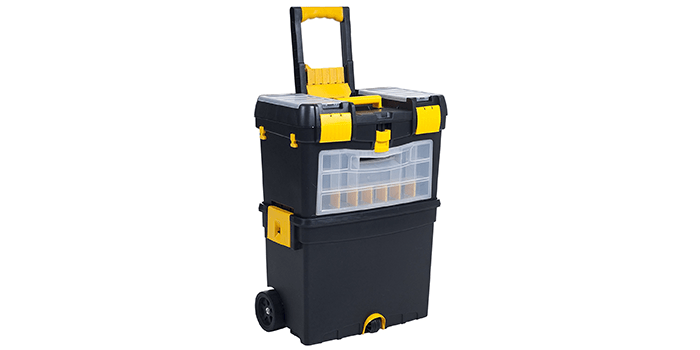 It comes with an extra-large capacity tool box which holds a large number of tools and can even hold power tools. The portable tote tray extends up to 3/4 length of the box which makes it easy to store larger tools under it without having to remove the tray. There is a water seal around the lid which ensures all your tools stay dry even when the box is exposed to weather conditions. The latches are made from rust-proof metal and a padlock eye for added security ensures that your tools will be kept safe at all times. 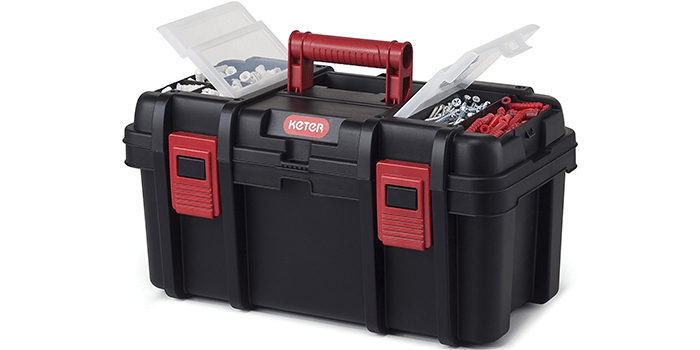 With the Keter New Masterloader Plastic Portable Rolling Organizer Tool Box, you won’t have to ever worry about losing any small tools or spare parts. The box comes with compartmentalized bins to properly segregate your tools and small parts, while a central locking mechanism keeps all your tools safe and secure at all times. A tool divider on the inside keeps you organized and the extendable handle allows you to roll the toolbox when required. The tires are made from hard rubber and can roll on any terrain, while the box also features two removable bins on the lid for quicker access. 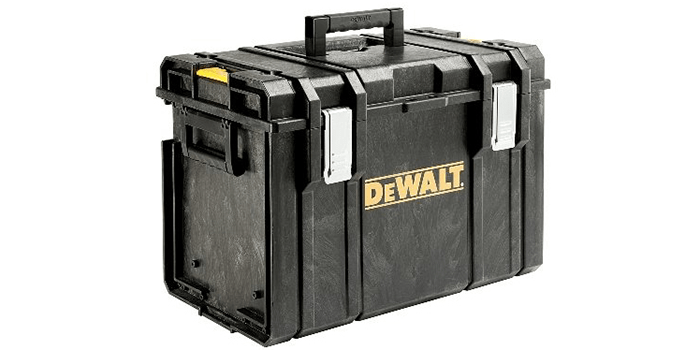 DeWalt is by far one of the biggest tool manufacturers on the planet and their toolboxes are equally great. This is precisely what we learn from their DWST08204 Tough System Case, which is a remarkable toolbox by most standards. 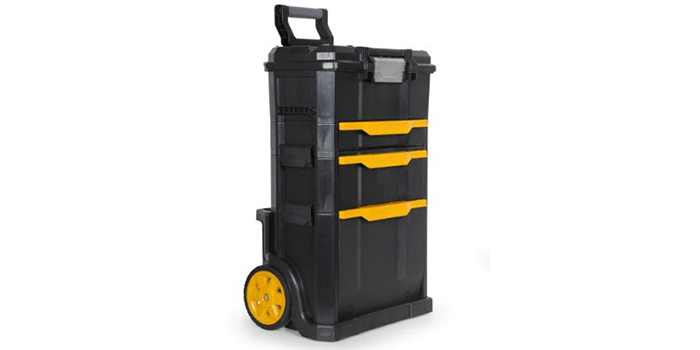 It is a durable foam box with a lot of storage space for a number of different tools, one that features an inner vertical storage space for larger tools as well as a removable tray for hand tools. The box also features side handles along with the primary handle which makes it easy to carry even with large amounts of weight. With its IP65 rating, the toolbox is guaranteed to be waterproof and bound to keep all your tools dry in any weather.